This project is a redevelopment of the existing Eglinton GO Transit commuter rail station in Scarborough, located between McCowan and Markham Roads. The primary program for the building includes upgraded passenger platforms and enhanced pedestrian and cycling access, as well as such completely original interventions as a new station building, tunnels and stairs, a structure for housing mechanical, electrical and IT services, and an elevated pedestrian bridge linking the station to overflow parking located across Eglinton to the north. It is the intention of the design team to create a facility that will raise the profile of the station within the neighbourhood and attract new users through its architecture and design. The architectural concept began with an acknowledgement of the irregular, wedge-shaped site, whose topography allows for both a main street-level area and an upper platform-level area. The conceptual design for the station was inspired by linear movement, forced perspectives and lines vanishing into the distance. The idea of a two-storey wedge-shaped building receding into a tight corner appeared to have an appropriate and interesting formal dynamism for a transit station. Beyond the initial formal response, notions of transparency, reflection and view have become important concepts to convey the visual and spatial experience of being at a train station. Transparency allows for visual communication of the building’s use and GO Transit’s overall aspirations to the street, the platform and to train passengers. The formal prominence of a transparent, glowing station building along Eglinton draws attention to the facility as potential users pass by the site. Reflection—through the use of glass and other reflective materials— accentuates the initial ideas associated with perspective and movement, and offers the potential to further display the experience and program of the train station. Finally, views have become an important conceptual design consideration. These include views from the outside into the facility, and from the inside to the exterior—but also views from cars and pedestrians travelling along Eglinton, and from the various levels of the trains that approach and pass by the station building. The design team has been studying an initial material palette including high-performance glazed curtain wall incorporating a custom ceramic frit patterning. This would maximize views into and out of the station building, increase the amount of overall daylighting, and reduce the overall demand for artificial lighting. 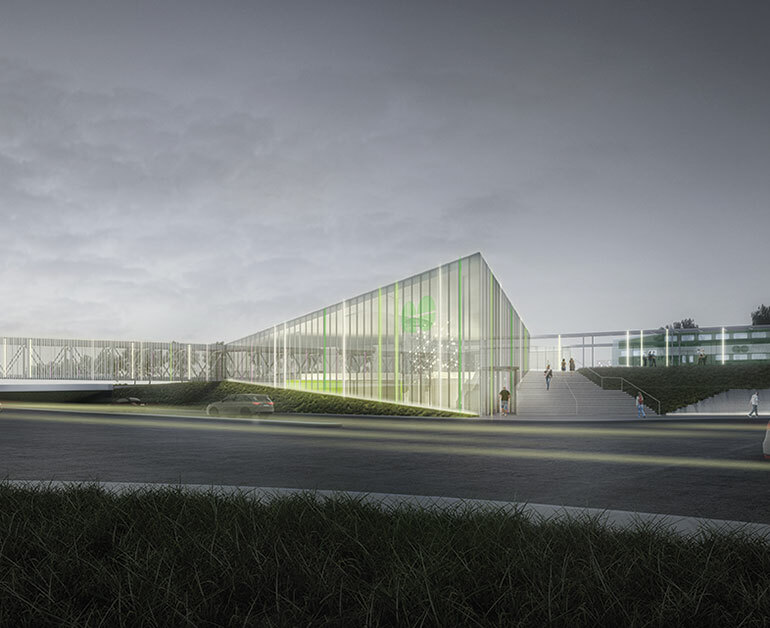 The suggested palette also includes polished aluminum panels for above-ground solid wall cladding, extensive green roofs for the majority of the station building, sedum tray planting fixed to exterior faceted concrete surfaces, and exposed cast-in-place concrete for the exterior retaining walls and other hardscape elements. MF: There’s a quiet elegance to this project. We appreciated the functionality and simplicity of the plan. It’s a gateway in the way it has been designed, and it is going to participate well in the landscape along the highway. PH: It’s a building about passage and threshold, and an example of what you can do with a utilitarian infrastructure that we haven’t paid attention to for decades. JH: This building has to be understood at two different speeds: from the automobile passing by as well as from the pedestrian point of view, when you get out of your car to catch a train. We look forward to seeing how the screen develops and how it can answer to that condition.